I placed another account of this trip with more detail on the trains with this movie at YouTube. The movie is made on iPad Mini, my regular camera having taken leave of its sensors... and the film was assembled using iMovie on the iPad, a perverse process somewhat akin to assembling a sailing ship in a bottle, plus involuntary rattlesnake noises added by some creature at Apple who designed this cut-down app... along with involuntary "Ken Burns Effects", the seasick effect of photos zooming out and in. 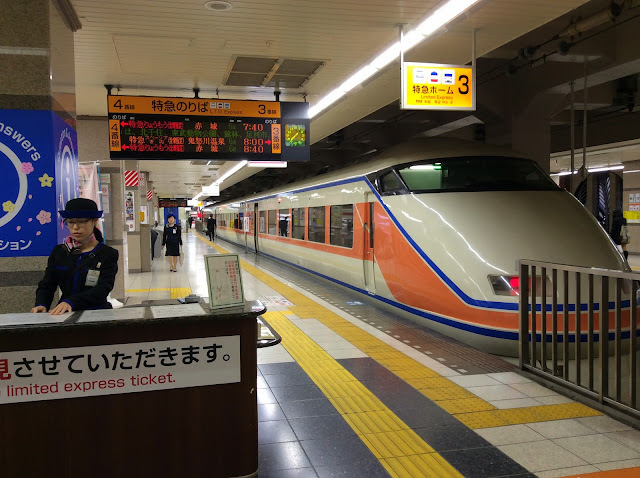 We took the 8am Tubo Limited Express Kinu from Asakusa to Kinugawa. At Kinugawa, we did that wonderfully Japanese thing of rushing train to train, trains being invariably precise and people being given in this case from arrival 0959 to departure 1001, the easy bit being that the second train was across the platform, the slightly complicating bit being that we were in car five of six arriving needing to get on a two car (one red, one white) diesel, way up there. We scrambled in the back door of the second, red, car, to discover that it was the plush lounging car, already occupied, among the pot plants, by a cheerful indeed garrulous gang of mature locals, beers in hands, at 10am, life living. We moved on to the less populated white with blue velour car, with its own pot plant in front window. Disbelieve if you dare, go watch the movie! This is, after all, the daily two car workhorse of the Yagan Railway and Aizu Railway. Parenthetical: the train inspector of tickets just went by on this Shinkansen, as it charges through the night and I can still write. 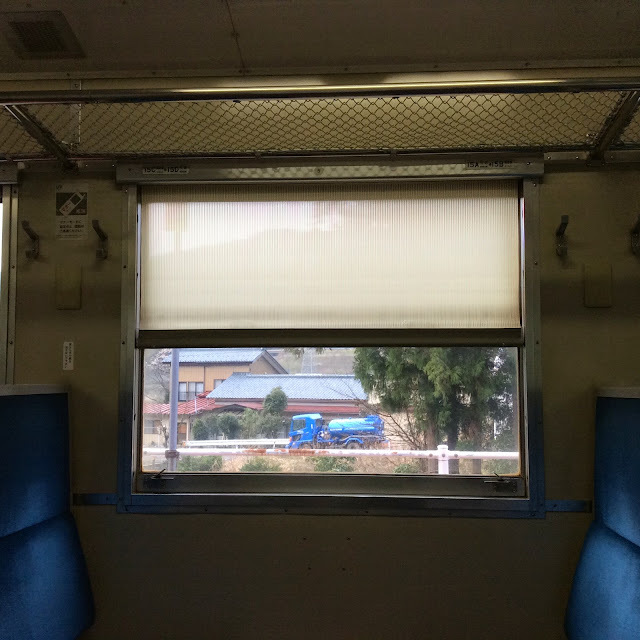 As is entirely routine thing on Japanese trains, he turned and bowed for a moment to the carriage before disappearing. Train shift teams also, I observed today, bow to each other on handing over. The land of the courteous, the dignified and respectful. Back to story... We stopped for an hour between trains at Yunokamionsen. 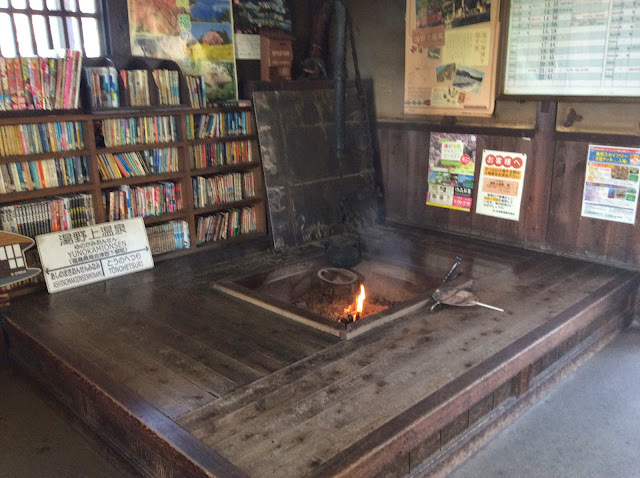 The only station in Japan with a thatched roof, perhaps the only one with an open fire? Surely the only one with a thatched roof, an open fire AND a foot onsen with hot alkaline water to soak toes (see video). 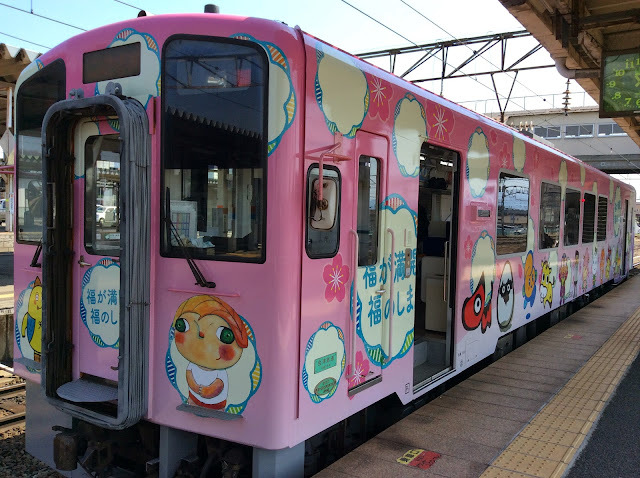 The Aizu trains and stations have embraced kawaii [cuteness] wholeheartedly. Important to note that these small trains despite size had beautifully appointed and immaculate toilets. Public toilets, railway toilets especially, have great variety in ingenious design. Well, the same basic elements of squat or swirl, but after that... Will keep for separate story. 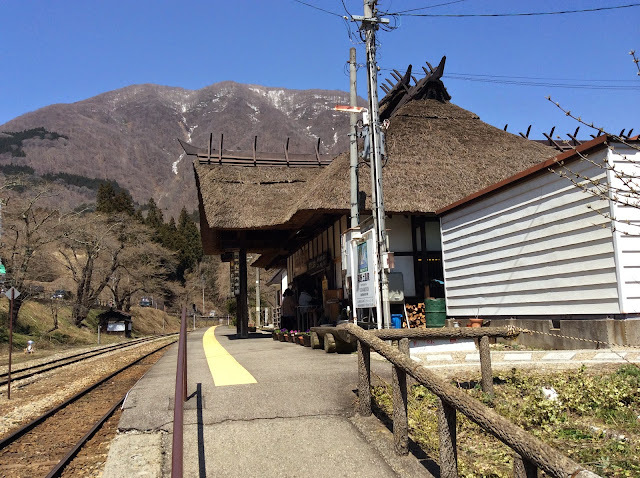 The 1230 single car train for Aizuwakamatsu was very much a local, stopping at every stop, Interesting people, interesting country,with snow on hilltops... Alas up in these mountains no cherry blossoms. For the most part rice fields still winter bare, just a few beginning preparations. 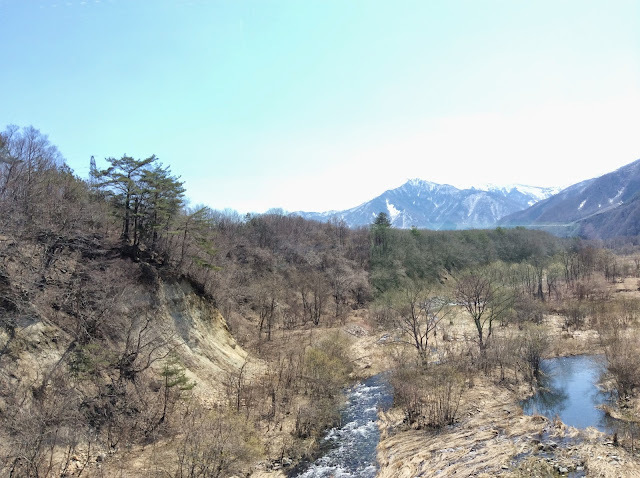 Aizuwakamatsu is hard to describe. We walked but got to see mainly that if we had time and inclination to walk further we just might see something. A bit like being plonked in a back street of Gouburn Helen thought. We got back early for the departure of the 1433 Banetsu West train. It came in early and of course we all rushed for seats. Two cars of seats between two dozen people. Setting off with snow on mountains, approaching mountains. 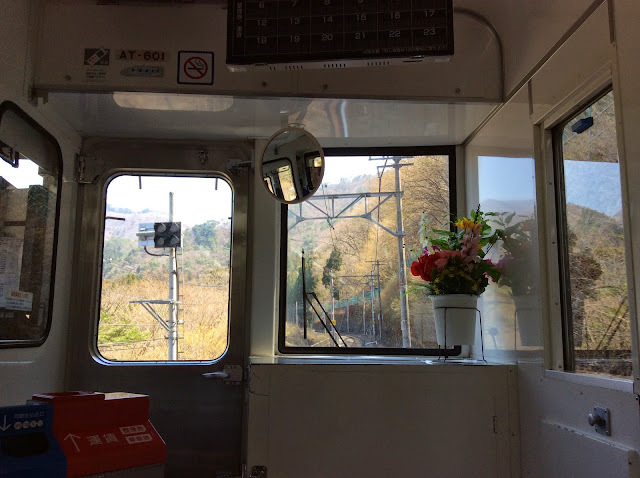 Inside the train, as on the Aizu train, wonderfully warm, on this occasion windows that could be opened to provide a welcome jet of fresh air. 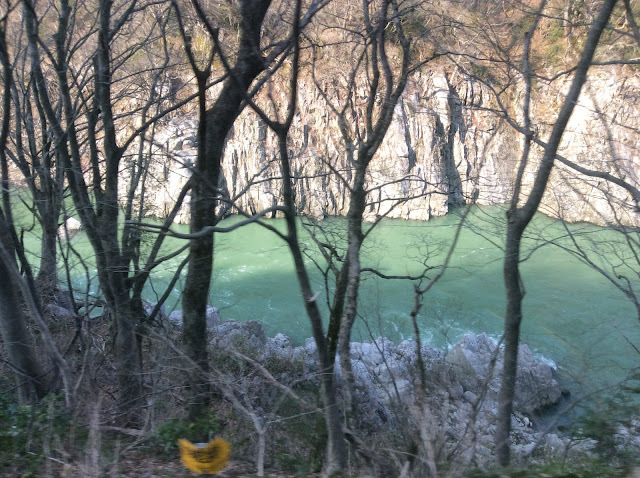 The character of the trip changed totally as we approached Niitsu and Niigata, into the world of afternoon commuting. At Niitsu we had the luxury of a five minute gap between trains, pelting up and down stairs with a mob from platform 1 to platform 4 and impressed now to get aboard an altogether bigger and very serious train after the deilghtful rides on little trains stopping-starting at tiny places through the wild. 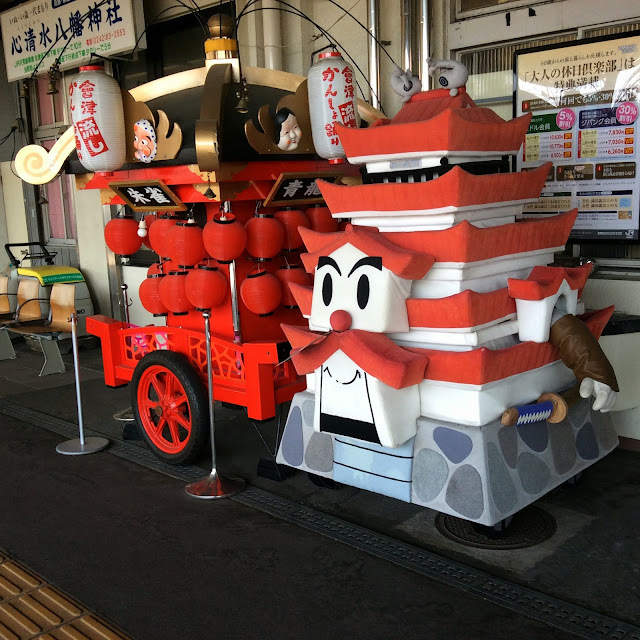 I had not known what character to expect in the city of Niigata. It was evident when we got there that we could have chosen from a thousand restaurants. 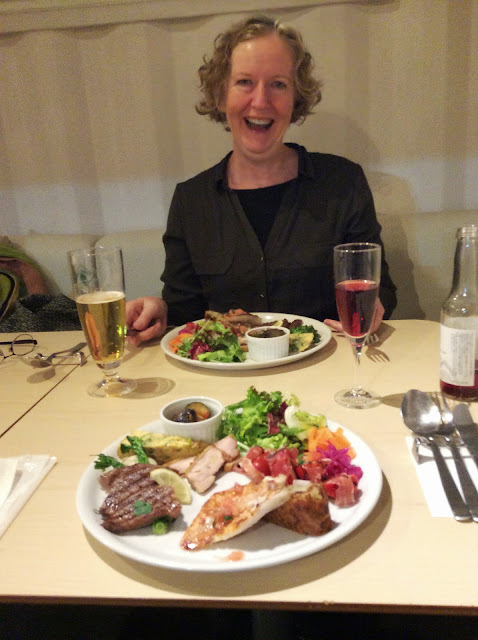 But curiously google maps had drawn me to a place called Piatto Giorno (Italian for dish of the day) several weeks ago. 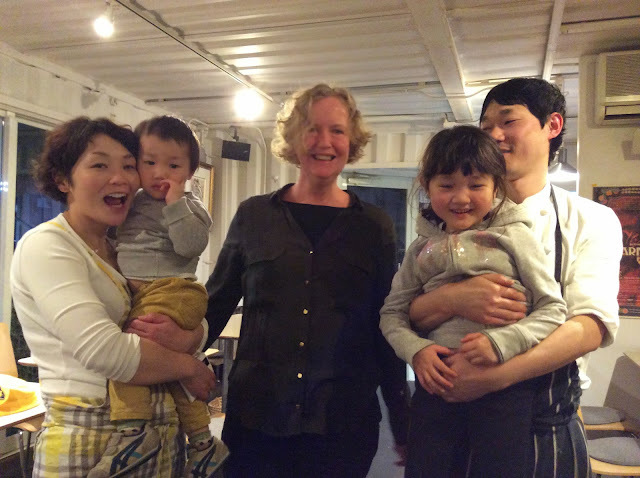 And I had asked Emi to call from Australia on my Skype account and see whether they could meet Helen's diet needs. Which the chef said he would happily do. And so we walked, aided by a gross google map on paper and by nice advice from a gentleman walking home the way we were going, through the sea-damp dusk of Niigata, to find Piatto Giorno. 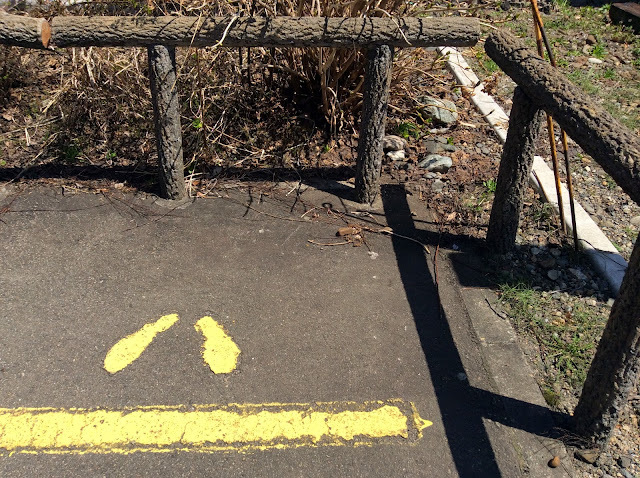 To walk through Niigata was a great pleasure. After leaving the built up area around the station we were on quiet streets with substantial dark serious houses. The air was damp and cool and full of the smells of deep cold sea. 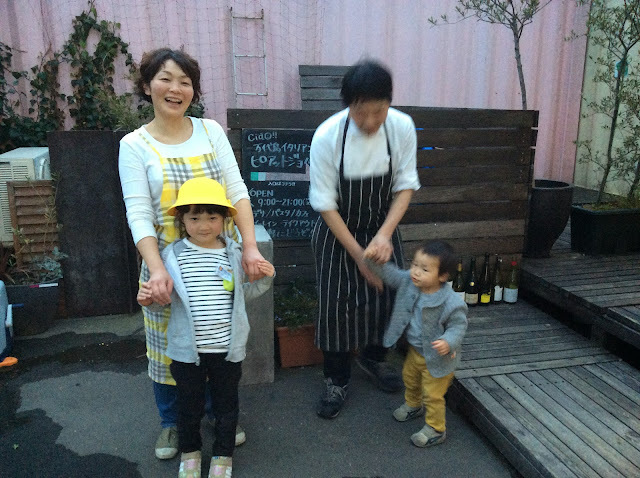 The family who own and run Piatto Giorno, mother and father and two young children, came running out the door with smiles to greet us. They had prepared our places at a table and also placed there an English translation of their daily menu chalk board. Such a nice welcome, such a great meal. 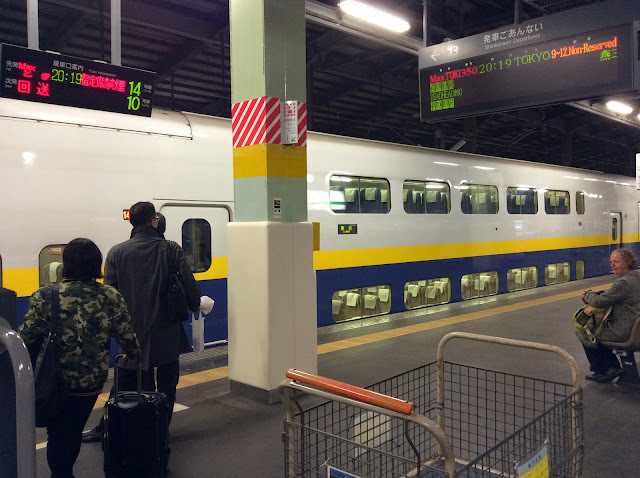 Now flying for Tokyo, 320km, two hours three minutes, from 2019 to 2222 hours, a train not to mess with. Double decked Shinkansen Max Toki. (it sounds fierce just to say it: "SHIN-KARN-SEN all short sharp and loudly MUCKS TOKKY!" Alongside me as I blog a young slim businessman works in endless spreadsheets of his day's business. I am just on holiday, but this is a serious working train. BELOW: Queueing for reserved seats, 2006 hours, thirteen minutes before departure, train still closed while cleaners clean and computers rotate seats... perhaps an internalised apprehension of being left behind. This is where to stop if the bell is telling you there is a train coming at the open crossing at Yunokamionsen.